Meeting the needs of all the children in your class seems like a daunting task. Because it is. However, classrooms in the 21st century are demanding this style. In fact, our whole society is demanding it. With the viral spread of technology and social media, the change in our language and ways of communicating is changing the way our education system must look. Don't get me wrong, change is good, technology is good, and yes, social media is good. What's not good about these things is the lack of physical- social interaction skills we practice in order to get through the day. The lack of problem-solving skills we practice because our phone does it for us. Not to mention the "havoc" that we reap on our entire sensory system from all the "screen time" that we log. 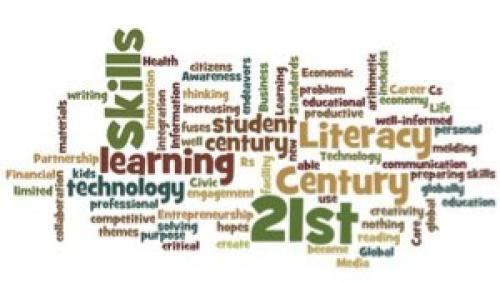 What Do 21 Century Learners Look Like? Over the past ten years of my personal experience as a Reading Interventionist, I have seen the classroom dynamic shift. Ten years ago, there was one, maybe two students that needed to be redirected to attend to their teacher and/or tasks at hand. Today, I'm redirecting at least 25% of the class, 50% of the time. Consequently, leading to lack of fully attending to a task, thinking critically and gaining efficient problem-solving skills. Therefore, we have students who can't sit still, attend for long periods of time, make eye-contact, or even speak a complete sentence with a complete thought. I'm seeing this from children of all socioeconomic statuses, race, gender, and cognitive abilities. How can we adjust to this new style of learner? Yes, we are going to have to adjust. Welcome to the 21st Century, people! Instead of trying to change a whole generation and their society we need to show them how they can use these tools appropriately and still meet physical and social/ emotional needs. These tools are amazing and can advance the human race to a point that is beyond our imagination. But it's not worth the risk of losing humanity. Every child has the right to an appropriate education. What does this look like? This looks like all children working in the same space on activities that meet their specific needs. This means the "regular classroom" is no longer "regular." (Whatever that means.) This means we probably aren't spending a lot of our day in a "whole group teaching" session. In fact, very little of our day should be whole group. Whole group teaching tends to lead to teaching to the middle. The high students are bored out of there mind = behaviors; and the low ones are lost=behaviors. There will be more noise, more personal interaction, more collaborative learning. There will be less teacher talk and more student discussion. The educator is the "map" the students will be the "navigators." Maybe not easy, but it can be accomplished. Communication is huge! Both literally and figuratively. We must communicate (in its many forms) on a daily basis with a variety of other people. It is important to have a language focus with any activity that is being practiced in your classroom. It is also important that students know how to have a conversation, how to speak then listen or listen then speak. It is important that students know how to read body language and facial expressions. Though it is sad, we do have to slow down and explicitly teach these skills or we will continue to just "spin the wheels." We need to teach respect. This is tricky. We can tell our students to be respectful but if we don't teach them what that means and what that looks like - they don't know. Again, with technology our society has become numb to violence and disrespect. We need to show our youth this is not acceptable. Even if the comments or actions are not meant maliciously and are made in jest. They need to know this is not okay. In a safe and respectful environment, the brain is able to work on the cognitive abilities needed to learn new things. We don't problem solve anymore. Why should we, when we have a computer on us at all times that will do the thinking for us. What we can do, is give our students the opportunity to problem solve. Rethink our plans and include activities that require our students to think. As educators, we need to learn how to utilize those technology tools to show them how they can learn and grow; how to use these same tools to think critically and collaboratively with people from all over the world and then how to bring it back into a situation in real life that they can apply it to. As educators, we think it is our job to tell our pupils what things are and how they work.Yet, as parents we let our toddlers fall over because they aren't sitting safely. We just say, "I guess they'll learn the hard way." Why don't we do that in education? Why do we feel the need to think for them? I often hear teachers say, "We have to move on, I have __________ subjects to teach before the big test." I think we have this silly notion that we have to teach so many "things" by this certain time. But who says what "things" a person needs to know? You know what I want my kids to know, I want my kids to know that everyone is different and has different circumstances. I want my kids to know that it is vitally important that they treat every human being with respect and non judgement. I want them to know that they have a purpose and a place in their world, and they are meant to do big things. It doesn't matter what knowledge base you have if you don't know how to problem solve. It doesn't matter if you can multiply the fastest or read the best if you don't have compassion. I want them to know that they can become, or do whatever they want to do, if they can problem-solve, think critically and work collaboratively with others. Join me on my journey of teaching in the 21st century, in all it's glory. The good, the bad and the ugly. What Are the Signs of a Strong E-Learning Translation?